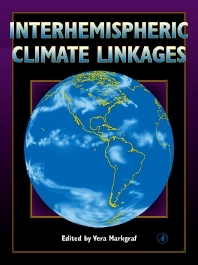 This book presents a novel approach in the field of global change by presenting a comprehensive analysis of interhemispheric linkages of climate, present and past, and their effects on human societies. The ultimate goal of this interhemispheric integration is to improve our understanding of causes and mechanisms of climate change to enhance our capability in predicting future changes. Given the societal interest in global change issues this book offers a new approach for the integration of global information. It will provide a reference for professional scientists, researchers and graduate students in the fields of climatology, and the earth and environmental sciences. 17 Paleotemperature Estimates of the Lowland Americas Between 30 Degrees South and 30 degrees North at the Last Glacial Maximum Bush, M.B., M. Stute, M.P. Ledru, H. Behling, P.A. Colinvaux, P.E. De Oliveira, E.C. Grimm, H. Hooghiemstra, S. Haberle, B.W. Leyden, M.L. Salgado-Labouriau, R. Webb 18 Neotropical Savanna Environments in Space and Time: Late Quaternary Interhemispheric Comparisons Behling, H. and H. Hooghiemstra 19 Holocene Vegetation Changes in the Americas Grimm, E., Hermann Behling, Julio Betancourt, S. Lozano-Garcia 20 Late Glacial Vegetation Records in the Americas and Climatic Implications Ledru, M.P. and P. Mourguiart 21 Temperate Coastal Regions in the Americas During the Last Glacial Maximum and Early Holocene Whitlock, C., V. Markgraf, P. Bartlein, A. Ashworth 22 Late Glacial Climate Variability GCM Modeling Experiments: An Overview Peteet, D.M.